Ubersuggest Review – Is It Worth it? Neil Patel acquired Ubersuggest on February 13th, 2017 for $120,000. It had over 38,000 backlinks, 8,400 referring domains, and 110,000 monthly visitors when he bought it. Those looking for a keyword research tool have probably come across it while searching for one. I’ve used it dozens of times myself while producing content, as I like to try out new tools and see how they pair up against each other. That’s why today I’m doing this Ubersuggest review. I’m going to show you how to use it, check out what others have said about it, and give you a final conclusion at the end. 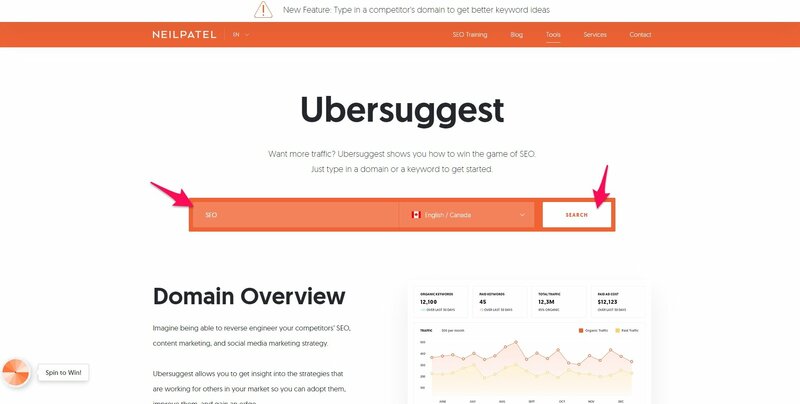 Ubersuggest is a free keyword research tool that was originally called Ubersuggest.io. It was purchased by the digital marketer Neil Patel as an experiment. He wanted to see if he could grow his business without any content marketing, but rather by offering free tools. Ubersuggest has many different features, helping you find keyword ideas, data, and analyzing competition. It’s a priceless tool to have in your arsenal, even if you have access to premium paid software. You will be able to gain an edge over competitors, dig deeper into their strategies, and discover what content is popular in your industry. Yes, Ubersuggest is completely free! And no, there isn’t a catch. You won’t get a content gate once you use five searches making you upgrade. Many other SEO tools like it only offer a certain amount of queries every day, and then require you to put in credit card information. The last thing you want is to research keywords or competitors and get inaccurate data. It would trickle all the way down your marketing plan, and create poor results. That’s why I decided to put Ubersuggest to the test against Google’s Keyword Planner. If you want to get the best information, it only makes sense to go straight to the search engine itself. I’m going to search for the term “content marketing” on both Ubersuggest and Keyword Planner to see how they differ. According to Ubersuggest, “content marketing” has a monthly search volume of 2,400. When I searched for the same term on Google’s Keyword Planner, their data claims it’s searched 90,500 times per month! You always have to remember that most SEO tools aren’t 100% accurate. Numbers are constantly changing, and they might not pull the most recent metrics. Additionally, depending on how the tool is built it will extract data from different sources, such as Google search, Adwords, etc. With that being said, I wouldn’t rely on Ubersuggest for search volume, but it still has tons of merit for other features that I’m going to show you ahead. Enter a keyword into the search bar on the homepage of Ubersuggest and click “Search” to begin. This will forward you to the keyword over page. 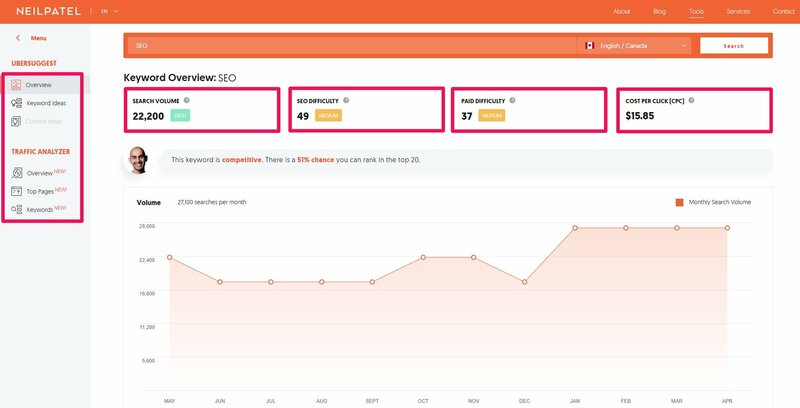 Here you will find all of the main metrics about the search term you entered. Search volume, as you could presume, is the amount of searches the keyword is queried on a monthly basis. This is an important metric to analyze, as it allows you to find phrases that will drive plenty of organic traffic to your website. The SEO difficulty score is how difficult it is to rank for that chosen term organically. It’s also good to have a blend of low, medium, and high competition phrases in every piece of content. Paid difficulty is the amount of competition marketers will face when using a keyword for paid Google ads. Those that invest into PPC will want to keep an eye out for this number. Lastly, the CPC is also recorded, which is the average price per click for paid ads. Below these numbers there is a chart showing the history of the search volume. This is useful to determine if a search term is seasonal or has growing interest. Click the “Keyword Ideas” tab from the left sidebar to find new terms to target. The list displays the same metrics as the overview page, and the results can be either exported out as a CSV file or copied to clipboard. This makes it convenient to search for new keywords, and organize them in another tool like Google Drive. On the right side is where the real magic happens. These are the top performing pages for the main keyword you entered. Analyze all of these pages to determine what word count, formatting, keywords, and other elements authorities are using. Most importantly, use this information to make something better. I love using this page to also figure out what style of content is popular. For example I searched “SEO” and mostly guides are ranking highly. Let’s move onto some new features of Ubersuggest, beginning with the domain overview. Enter in the URL of a website you’d like to analyze. I’ll use one of my favorite blogs to read, Copyblogger. It displays the organic traffic, amount of keywords they are ranking for, paid keywords, and paid costs. So many tools on the market will make you pay a hefty monthly fee to get this kind of data, so I have to say I am very impressed with Ubersuggest because of this. 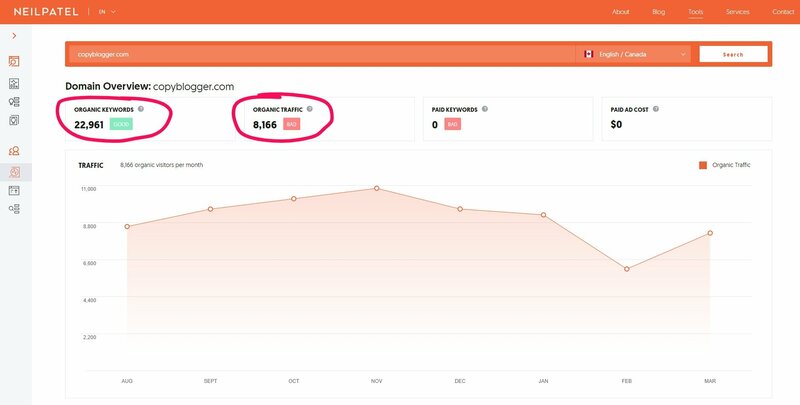 Just like with the keyword overview page, you will find a graph that outlines the history of traffic on the domain you entered. Scroll down and Ubersuggest displays a breakdown of ranking positions, and the website’s top pages. The rankings help determine how much of an authority a website is, and the top pages are awesome for coming up with more content/keyword ideas. On the bottom of the page there are the main keywords the website is ranking for, as well. You can view all of this information more in-depth by clicking the “View All” buttons underneath the respective charts. Honestly I can’t recommend Ubersuggest enough. It’s helped me countless times in my content marketing and SEO career, but I also suggest having several tools in your arsenal. This will maximize the amount of keyword and content ideas you can find. Here are some alternatives to Ubersuggest with that being said. What has your experience been so far with Ubersuggest? Would you recommend it to friends?